I’ve dedicated this post to my wife. She’s managed to stay positive as I hound her with all the trivial ramblings I’ve worked on for this blog… I got the inspiration to write a brief post about Beale Street in Memphis, Tennessee while listening to my wife playing some tunes from her all time favorite artist Joni Mitchell. What does Joni Mitchell have to do with the blues or Beale Street you may ask? Not as much as she has with jazz or folk music, but there are some influences in a few of her songs. One tune in particular is Furry Sings the Blues, written for her meeting back in the seventies with old time Memphis blues player Furry Lewis and her experiences of Beale Street and its music scene at the time. Briefly for the folks not familiar with the history of the famous Beale Street – It’s a street that runs almost two miles in downtown Memphis from the Mississippi River to East Street. And is a significant location in African-American history and the history of the blues. 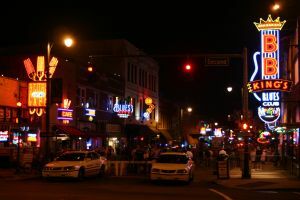 Beale Street is not some ordinary street in the United States. It’s one of the most important streets in the history of blues music! Handy wrote the above lyrics from the classic song Beale Street Blues in 1916. 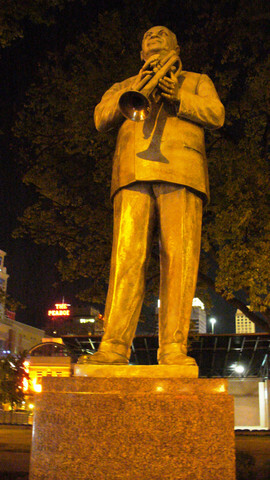 For decades afterwards many famous blues and jazz players made their name on Beale Street. And helped develop the style that would become known as The Memphis Blues. When the request was made Furry agreed to meet with Mitchell. She had a keen interest in his past. 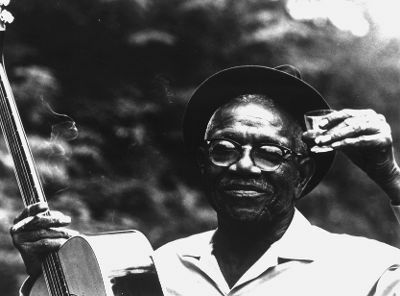 After all, he was one of the original slide guitar players in W.C. Handy’s band and played on Beale Street at that time. He not only had a first hand knowledge of the history of the blues, Furry was part of it! He greeted her with the same kind of down home kindness that he would treat any visitor. They discussed the old times and Joni observed his current surroundings and the vibe of the neighborhood at the time. I’m sure she left with an incredible insight and richer for the experience. Furry would not feel the same way. He point blank told her that he didn’t like her. When Mitchell released her Hejira album in 1976 with the song Furry Sings the Blues, he hated the song and “that woman,” as he would put it that sang it. From what I understand, the song was inspired by this meeting, but mostly it was a commentary of the existing landscape of Beale Street which was getting very run down by that time in the seventies. The song paints a bleak picture of the current state of affairs on Beale Street as she recalled when she was there. The song was more about that mood than anything else. She only mentioned his name and a few aspects, but the song was never totally about him… However, many people close to Furry would disagree. Furry thought he should have received some kind of a royalty for singing about him. Even though a section of Beale Street in 1966 would be declared a National Historic Landmark in 1966 and Home of the Blues by an act in congress in 1977, it still experienced a bit of a collapse. Many of the stores closed and it lost much of its allure. The following is a video of Joni Mitchell’s song Furry Sings the Blues and features a young Pat Metheny. It is not meant to spur any controversy. It is only meant to enhance the subject matter of this post. Perhaps Joni should consider a sequel to the song? A version that paints Beale Street in a more vibrant manner as it is known from its rich history to it’s vibrancy of today? What do you think? Interesting. I used to see Furry perform in the late 70s in Memphis. Think Joni got media attention for Beale Street and the revitalization began. Now its the Cities biggest tourist attraction. Very interesting post, lots of stuff I did not know about. Thanks so much for the interesting details in your article. Frankly I don’t know much about the blues. So keeping on reading about it, gives me a bigger insight to what it means. We all heared about the influences it had on rock & roll and pop music, but if you only listen to these two only, you will not develop any bigger insight. Best is to listen to it. For me it started when I watched on dutch TV, a documentairy about ‘Catfish Blues’, more then 20 years ago. From that moment on I listened more carefully. And keep in mind, it was new to me, being brought up with classical music. What I really liked about reading your article is that you start with the tribute to your wife, then her music and so following the lead via Joni Mitchell to Memphis. After that the article becomes a ‘little’ adventure. well I don’t think it’s supposed to be a ‘Furry Tribute’ nor a tribute to Beale Street. (I have to admit I enjoyed looking and listening to Pat Metheny better, by the way thanks for that information: I would not have recognized him.) Maybe it was merely a reflection on a trip she made like ‘Prin’ did. He told us about such a trip in his comment on tour article. 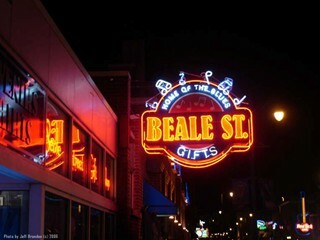 “the famous Beale Street: ” – I was there once: WOW. I was in awe and cannot wait to go back. Very nicely done, thanks for reposting this. I loved your post. thought some readers were a bit harsh regarding joni mitchell. i think she is a fantastic artist that can paint a picture with words and play a mean guitar. she should be applauded for having had an interest in blues and its history and bringing it to the attention of those who otherwise wouldn’t have known or cared. Great for re-posting this. I totally agree that if a follow-up song should be done it should be done by Joni Mitchell. This was not a tribute to Beale Street or Furry, it was, as you said, a description of how history had fallen into disrepair. Many of your posts are about how music creates change, especially blues music. Obviously it changed Joni Mitchell enough for her to write this unique song. And her music changed Beale Street. …. another fantastic article and review from the BluesBlogger !! Loved this post, I was at one of the first Beale Street Music Festivals, it rained naturally, we went to the Orphium theatre, I remember seeing Ricky Nelson and Roy Orbison perform. I have tried to find more info on this, what year-who else performed-etc. Can you help? I just got back from visiting Beale myself and I found the place to be absolutely mesmerizing and filled with history and air from such. I got to Memphis… I hope I will get to it again.